In large saucepan, cook onion, celery and bell pepper in butter until soft. Add ham and tomato sauce; simmer 15 to 20 minutes. In separate saucepan, bring navy beans with bacon to boil. Puree beans and their liquid in a food processor or blender; add to ham mixture. Add the water; season to taste and simmer for 1 hour. 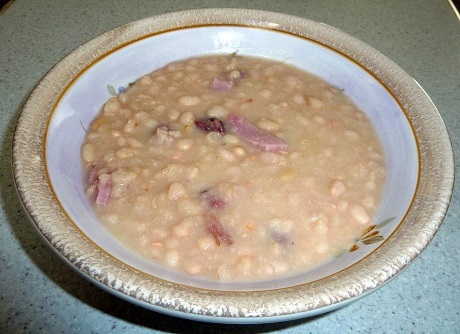 Serve this Creole white bean soup piping hot, with cornbread if desired.